Now that it is chilli season, my tree is bursting at the seams plus my mother and daughter often give me some of their chillies. That's where my chilli sauce has come in handy. I love my chilli and so I often eat my meals with Sambal's delicious sauce but when I have my sauce in the fridge, I much prefer my one! The apple in this sauce provides a natural sweetness and thus only a little sugar is needed. Also, there is no vinegar in my version, something I don't like in chilli sauces. Don't be afraid of the entire garlic bulb... I promise you won't taste it! 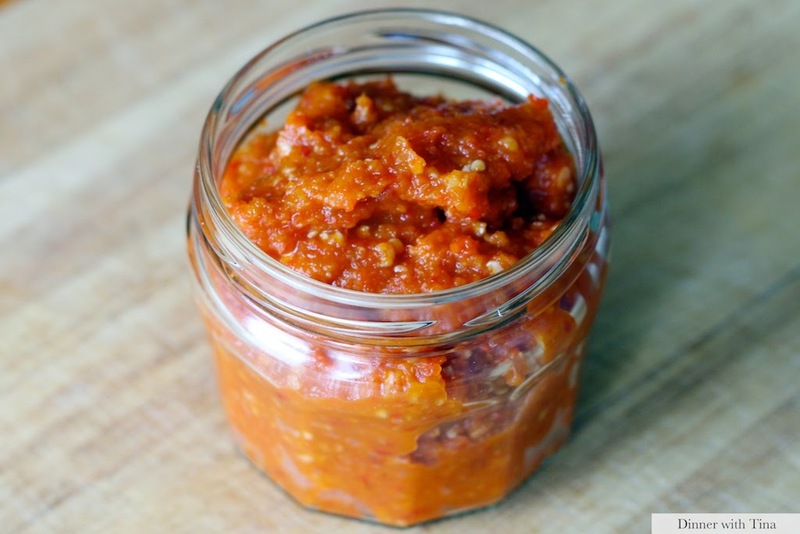 This sauce is a little hot (depending on what type of chillies you use) so be prepared for your house smelling like chillies when you do make this! - Pour into a 600g sterilized jar. Allow to cool before storing in the fridge. Note: The sauce will last up to a month in a sterilized jar if a clean spoon is used when added to dishes.